On the home page you will find content (centre page) and tools (bar at the top of the page, small print). This is where visitors find Wikiwater’s simplified content organised into a few main subjects and where they can access all of the site’s electronic files. 1) You can easily see on the screen what theme your question is related to. Click on the theme. A drop-down menu gives the complete list of the corresponding files. Click on the title of the file you want. 2) Would you rather see a list of all the files ? Click on the bottom left of the “List of files”, where they are organised by subject, then click on the one you want. 3) Do you need to do a faster search ? Just type the subject you are looking for in the window at the top of the table and then hit enter. Remember to choose your search words carefully ; don’t type a whole sentence, just a few key words that describe the subject succinctly (the wiki includes several hundred keywords and word associations, but it is a limited number… For example : pump, water pump, rope pump, but not cost and maintenance of a rope pump). The site will indicate all the files that contain the words searched for and you can pick the one(s) you want to see. 1) Click on the word “home” (in small print) on the tool bar at the top left of the file. 2) Or even easier, just click on the wikiwater logo also at the top left. 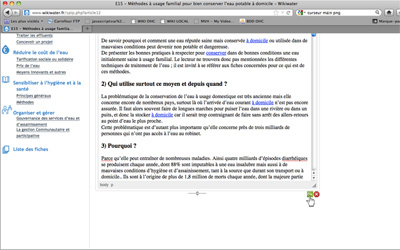 This toolbar (on the left) allows you access Facebook and other social networking and information sharing sites and also to send a link to Wikiwater to friends (envelope icon), and on the right hand side you can enlarge some parts of the text (A< A button) (such as drawings, tables, etc.) 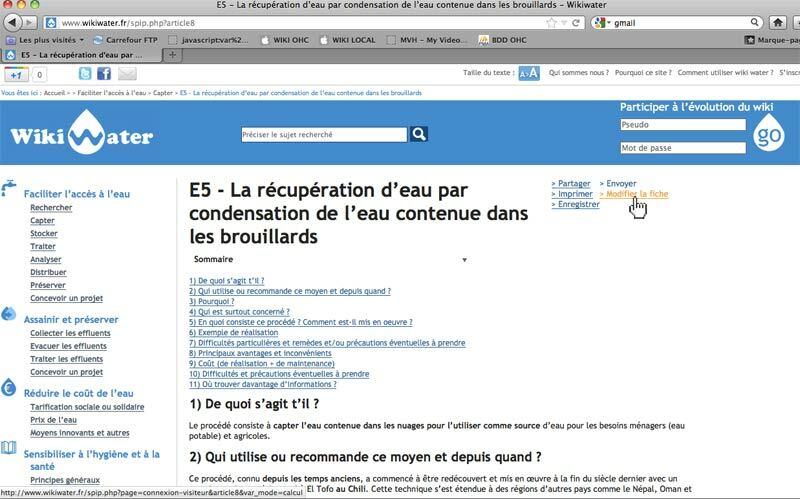 and access the documents that introduce Wikiwater. 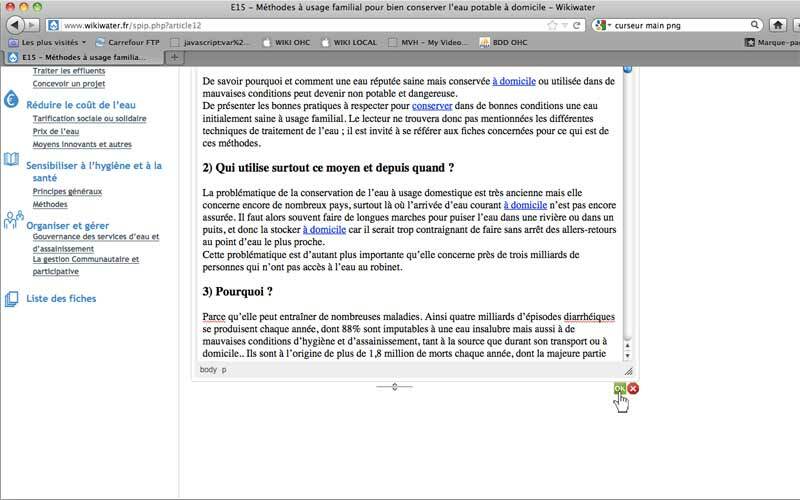 You will notice that this toolbar has many more functions on other Wikiwater pages, where it allows you to print, download or send the file (or a link to the file) to someone. All you have to do is click on the word you want (they are usually at the top right of every file. You’ll find two other buttons there as well : “Share” to go to Facebook, Twitter or other similar sites and “Sign in” (see below). Important note concerning downloading : feel free to click on the links (in blue) that you will find at the end of every file, they will give you direct access to other documents and videos, but you may have to be patient as the wait time for documents on the Web depends on the speed and setup of your network or internet connection and it may take several minutes (you will be able to continue doing other research while you wait). We should also mention that as the internet changes some of the links to documents given may not be available if the authors have deleted them or if the site has been changed or deleted. Please let us know if a link is no longer valid so that we can correct the file and include other links. Use the “Sign in” button or the larger window “participate in wiki changes” that you will see on the homepage or other pages (at the top right in the blue band) or, after you have signed in and received a password (see below), you will just have to enter them and click on “GO” to access the form and then you can make your remarks and suggestion. To create an account, simply go to the very top right corner on the homepage, click on “sign up” and give your name and email address so that we can send you a password and from there you can go to “participate in wiki changes”. 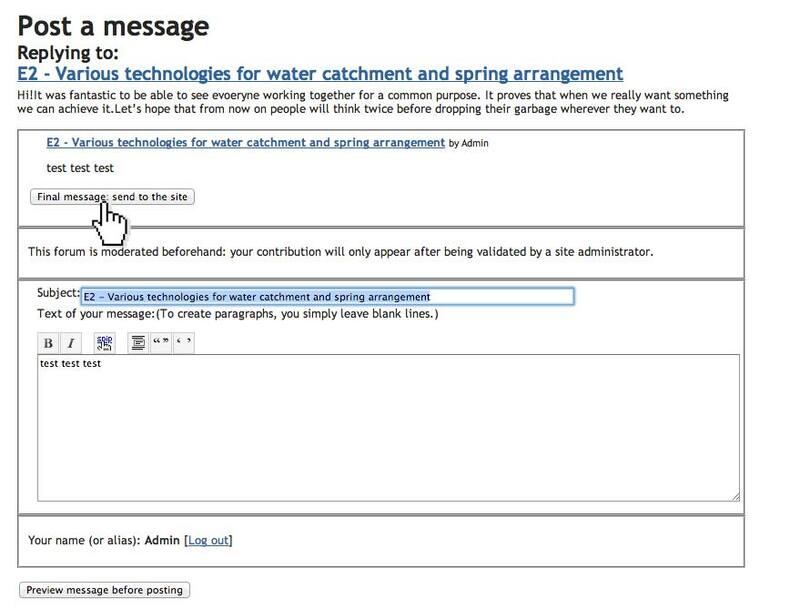 3) How do you post a comment on an information sheet or ask the Wikwater team a question ? Each information sheet has a Forum discussion area where you can leave a comment or ask questions. As indicated on this page, your message will only appear on the site once it has been validated by the webmaster’s team. 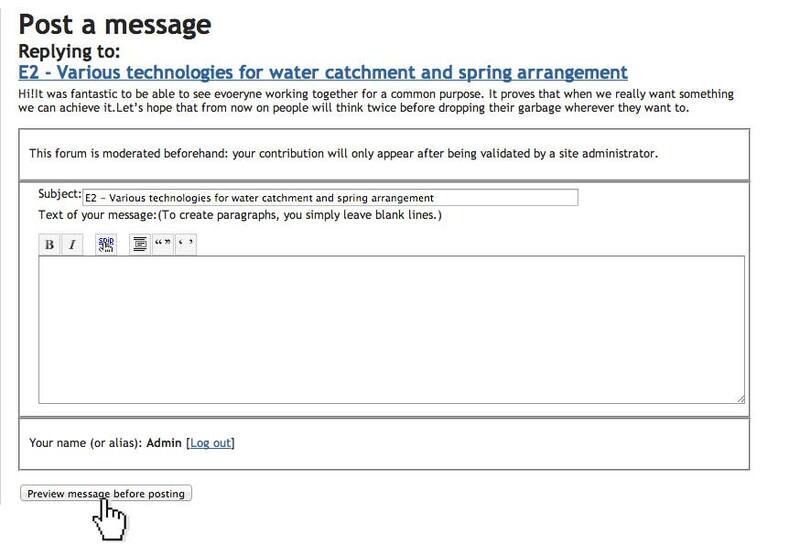 You come to this page : here you can see your message before sending it to the wikiwater team. Click on “Final message : send to the site” to validate your message permanently. 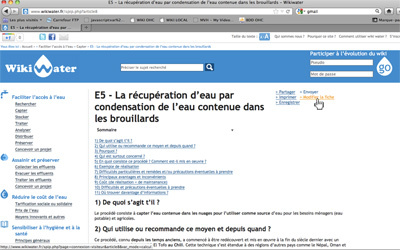 The webmaster’s team will then process it and put it online on wikiwater.fr. Thank you for your attention. Enjoy browsing the website.